It is possible to observe the plasmolysis of cells under the microscope. When salt water is added to onion cells, then the cells will lose water due to osmosis, this can be observed. For this experiment, we can not use the onion skin which is found between the layers of the onion. We need a single layer of pigmented cells. These cells, however, do not separate easily. We need a thin layer of cells of the red part of the onion. It is not possible to directly cut a single cell layer, so we need to use the “peeling method” to obtain a single layer of cells. Obtain a small piece of onion about (1cm x 1cm). The onion layer is about 2mm thick. With the red side of the onion facing you, cut beneath the red layer, about half way into the onion. 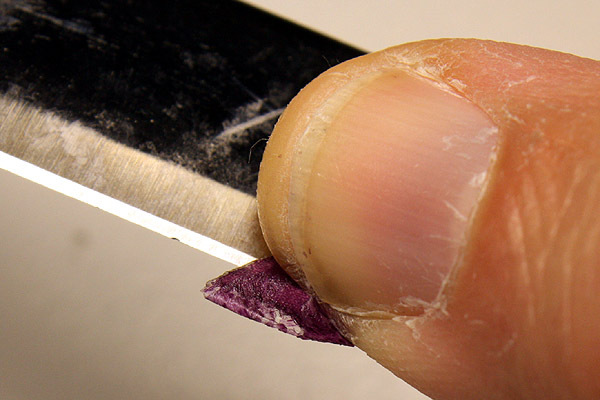 This cut does not have to be very thin. There will be about 1mm of onion between the knife and the red pigmented layer. Press the onion firmly against the knife with your thumb. Now tear off or peel away the red part of the onion. The red layer will become thin. Some red pigment may be released from broken cells. Cut away and discard the thick part of the onion (the place where the initial cut was placed). Observe the remaining cells (the thin, peeled part) under the microscope (using a glass slide, water and cover slip, of course. Only consider those cells that are filled with the red pigment. White cells are broken and have lost the red pigment. If there is too much water beneath the cover slip, then the salt water will not flow between the cover slip and the slide. In this case use tissue paper to withdraw water from one side of the cover slip while adding the salt solution at the other side. Observe what happens to the red pigment inside the cells. Water from the cells moves to the surrounding salt water. The shape of the cells does not change, the cell wall maintains the cell shape. The cell content (the red part of the cell) starts to shrivel up. At the same time it is possible to see that the intensity of the red pigment increases because it becomes more concentrated as water is removed (the red pigment is not able to move out of the cell). The process can be reversed when the salt water is removed and when distilled water is added. Instead of simply using concentrated NaCl (salt) solution, it is also possible to make solutions of different concentrations. In this case it should be possible to see a stronger plasmolysis with the higher salt concentrations. Try to determine the highest NaCl concentration at which no plasmolysis can be observed. This concentration should then reflect the water potential of the onion cell inside. Alternatively, it is also possible to repeat the experiment with sugar water of different concentrations. Add a drop of rubbing alcohol to the cells. Alcohol also has the tendency to withdraw water from the cells. Carefully tear off the layer of red cells. Remove the thick part of the onion (where the cut was made) and only observe the thin layer. Many cells will probably break open during this process and be useless, we only need a few intact cells. 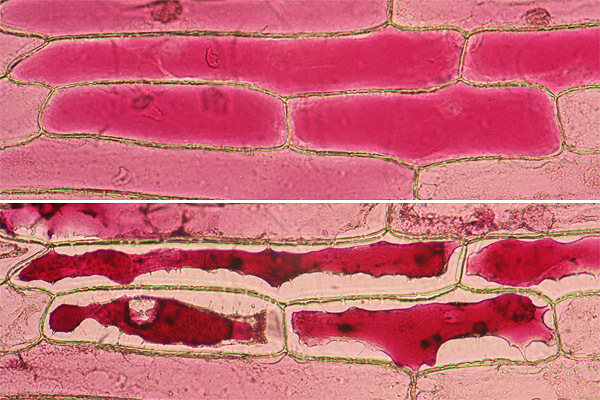 The top image shows the cells before plasmolysis. The cells are filled with a red pigment and appear pink. The bottom image shows the same cells after the addition of saturated salt water. Intact cells will lose much of the water due to osmosis. The concentration of the pigment rises resulting in a darker color. The shape of the cell wall remains unaffected.